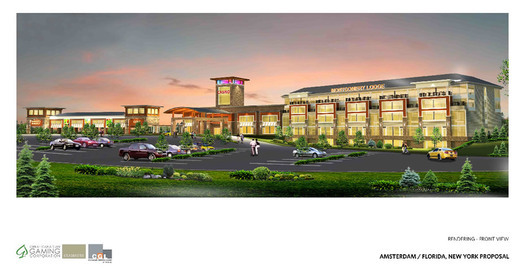 One of the renderings included with the Amsterdam/Florida casino site application. The state Gaming Facility Location Board -- AKA, the people who will be picking which projects get granted a casino license -- disqualified the application for the proposed Amsterdam/Florida casino in Montgomery County at a meeting Thursday evening. The unanimous decision was based on a determination the group backing the project had filed an incomplete application (the board's staff cited incomplete sections of the app in in a document for Thursday's board meeting). The board decided that considering the incomplete app would be unfair to the other competitors. So, now there are four applications competing for the Capital Region license: Howe Caverns Resort & Casino - Cobleskill; Capital View Casino & Resort - East Greenbush; Hard Rock - Renssealer; Rivers Casino & Resort at Mohawk Harbor - Schenectady. Public presentations of the applications will be September 8-9 at the ESP (they'll also be webcast). And there will be public comment sessions -- the one in Albany is scheduled for September 22.